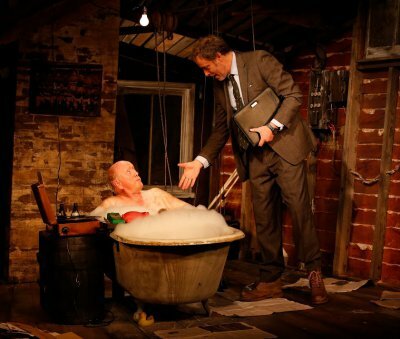 A very funny Irish dark comedy about a cantankerous wily rural 90 year-old man in his bathtub clashing with a city slicker over a valuable property. 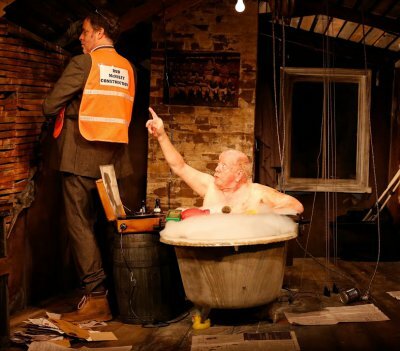 Lying in a grimy bathtub with bubbles and squeaky toys for the entire length of The Quare Land, Peter Maloney gleefully plays a cantankerous 90-year-old rural and wily Irishman in this dark comedy that runs 75 minutes. Mr. Maloney is a veteran character actor of stage and screen with New York City theater credits going back to 1964. This leading role of Hugh Pugh is a marvelous showcase for his immense talent. With a perfect accent, graceful physicality, and his grandly expressive face, deep set eyes, and prominent bald head he creates a riveting characterization out of Samuel Beckett. Visually and vocally he effortlessly combines humor, pathos and malevolence in this towering and memorable performance. In 2012, due to an impending visit by his 91-year-old brother, Pugh is taking his first bath in four years when he is unexpectedly visited by real estate contractor and developer Rob McNulty. The middle-aged businessman is there to negotiate the purchase of Pugh’s five-acre field to expand his golf course from nine holes to 18. Rufus Collins as McNulty meets the challenge of holding his own with Maloney. Mr. Collins charismatically offers a fully dimensional portrait of the city slicker out to close a deal no matter what the consequences. His expert comic timing and dramatic presence energize what could have been a predictable caricature. Irish playwright John McManus’ dialogue is laden with mordant Irish wit and plenty of colorful details woven in such as the old man’s unseen dog Jesse James and his adoration of Enya. The greedy opportunist versus an idealistic soul has long been a staple of dramatic literature and Mr. McManus has crafted a delightfully fresh and cleverly theatrical take on it. Director Ciarán O’Reilly’s staging has a variety of business and keeps the pace and action energetic. Mr. O’Reilly’s work with the actors has yielded excellent performances of great charm and depth. The play begins with the sight of a small crooked ramshackle farmhouse that pivots to reveal Pugh in his dilapidated bathroom. Scenic designer Charlie Corcoran’s work is highly accomplished and superbly realizes the physical dynamics of the play eliciting laughter from just looking at it. The lighting design by Michael Gottlieb, the sound design by Ryan Rumery and M. Florian Staab, and the special effects by Bodhan Bushell of J&M Special Effects, all aesthetically combine to give the production a compelling small-scale epic presentation. Costume designer David Toser’s suit for McNulty is an authentic representation of that of a striving tycoon. The Quare Land was first performed in Ireland in 2010, and The Irish Repertory Theatre is presenting this American premiere. It’s a hugely enjoyable blend of absurdity and harsh reality. New Nicky Silver play in desperate need of a third act as it doesn’t have an ending or resolve its plot. A choppy memory play with a Young Adult slant as a woman details her trauma over of the death of someone close to her. It’s well played but over produced. An engrossing drama exploring the Rwandan Genocide set in 1999 as a NY Times reporter investigates charges of heinous collaboration against two nuns. NYGASP offers entertaining vest-pocket versions of two rarely staged comic operettas by Sir Arthur Sullivan, with and without W.S. Gilbert.